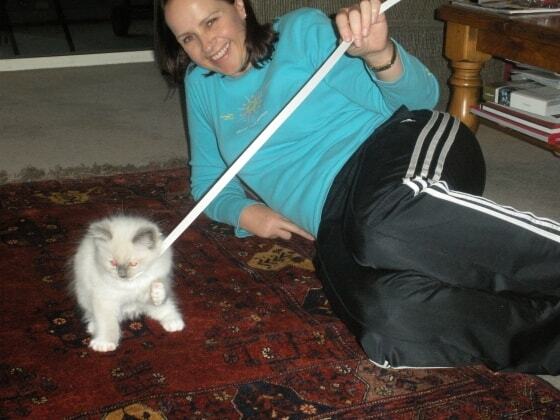 Hi Cat People I am the owner of a beautiful ragdoll named Elmo. I have loved cats from birth if that's possible and have had one in my life whenever I could! I grew up in the country surrounded by animals and pets, they seem to love me. I can also help with watering the plants, bringing in your mail and feeding a rabbit, goldfish, guinea pig. I am happy to give your cat some cuddles while I am there and play if he or she is in the mood....because we are their servants it really depends on them doesn't it?!?! And love dogs too....who doesn't enjoy taking a beautiful dog for a walk. such a nice experience and great reason for us humans to get outside and get some exercise for ourselves too. Anne Maree is a great petsitter. She came twice a day during 10 days to take care of my diabetic cat and managed very well the injections and some ears infections. She send to us some photos and even a purring record of our sweat cat.